(NaturalNews) Essential oil of cinnamon is a potent antibacterial agent that may be useful as a natural method for preventing the spread of foodborne illness, according to a study conducted by researchers from Washington State University that is scheduled for publication in the journal Food Control in December 2014. 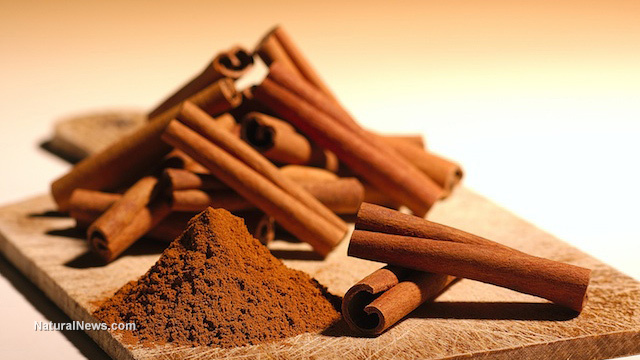 The study was conducted on the oil of the cinnamon variety known as cassia or Chinese cinnamon (Cinnamomum cassia). This is different from the Ceylon variety (Cinnamomum verum) more commonly used in cooking. Researchers tested the essential oil against the top six strains of a variety of Escherichia coli (E. coli) bacteria known as Shiga toxin-producing E. coli, or non-O157 STEC. The U.S. Department of Agriculture Food Safety and Inspection Service has a "zero tolerance" policy for these six strains in raw ground beef or trimmings. This means that, if any of the six strains are detected in these products, the food is considered tainted. Non-O157 STEC is responsible for approximately 110,000 cases of foodborne illness in the United States each year. The researchers found that just 10 drops of cinnamon essential oil in a liter of water were able to kill all six strains of non-O157 STEC within 24 hours. "The oil can be incorporated into films and coatings for packaging both meat and fresh produce," researcher Lina Sheng said. "It can also be added into the washing step of meat, fruits or vegetables to eliminate microorganisms." Growing concern over the health effects of chemical preservatives and other food additives have led to a growing market for natural alternatives. The Washington State researchers are now planning to investigate whether dandelions can be used to inhibit the bacteria that lead to bacterial mastitis, a mammary infection, in dairy cows. "Our focus is on exploring plant-derived natural food bioactive compounds as antimicrobials to control foodborne pathogens, in order to ensure safety of fresh produce," co-author Meijun Zhu said. In recent years, many other researchers have also been exploring natural food preservatives and antimicrobials. For example, a study conducted by scientists from the National University of Technology in Argentina and published in the journal Food Chemistry in 2007 found that propolis extract could also function as a natural antibacterial preservative. Other than preventing the spread of illness, food manufacturers are primarily concerned with preventing oxidation, which is a major factor leading to food spoilage. That is why two of the most common food preservatives, butylhydroxyanisole (BHA) and butylhydroxytoluene (BHT), are actually synthetic antioxidants. This may actually classify rosemary and sage oil as among the most effective food preservatives ever discovered. Many plants, however, produce antioxidant compounds to protect their own cells from injury, and we consume many of these antioxidants in the foods that we eat. Numerous studies indicate that some of these same antioxidants could also be used to preserve food. For example, a 2006 study by scientists from the University of Extremadura in Spain found that essential oils of rosemary and sage were actually more effective at preventing meat spoilage than either BHA or BHT. Another study, conducted by Portuguese researchers and published in the journal Innovative Food Science and Emerging Technologies in 2008, found that olive and grape extracts (byproducts of olive oil and wine making) were also more effective preservatives than pure chemical antioxidants. Another study, conducted by researchers at the Indian Institute of Technology Guwahati and published in the journal Food Research International in 2008, found that various traditional Indian food and medicinal herbs were also effective food preserving antioxidants.